Oil and gas companies around the world have begun turning to a new defense in the fight against corrosion. As the ultimate protection against environmental and chemical damage, EonCoat provides a long-lasting safeguard that no other coating can beat. Thanks to its unique formula, EonCoat® has now become a renowned protective coating across industries. The coating even earned commendation in front of the world’s oil and gas leaders at the prestigious EUROCORR conference in 2018. Proven to work in applications from energy to infrastructure and municipal sectors, and in climates ranging from dry to wet and even coastal, EonCoat® has quickly spread throughout a range of regions, countries, and industries. Because it’s up to 9.6 times stronger than the alternative epoxies on the market, and 16 times stronger than polymer paints, EonCoat® even holds up in hazardous marine environments. 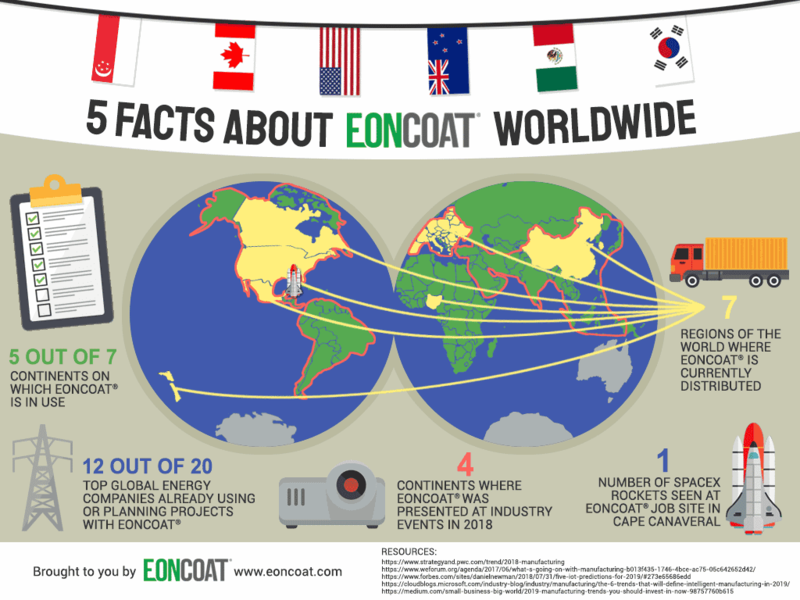 With distributors in various locations around the world, it’s easier than ever for any business to discover the benefits of EonCoat® for themselves. Already, more than half of the top global energy companies worldwide rely on EonCoat® to keep their business running smoothly with unbeatable protection. Check out our infographic below to discover how EonCoat has transformed the way companies manage their carbon steel assets all around the globe.